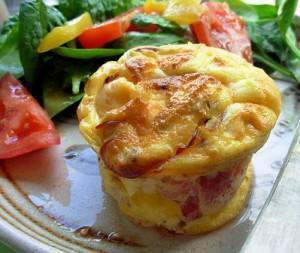 Celebrate National Cheese Soufflé Day with this delicious warm cheese soufflé with crispy Bacon! Don't be intimidated because it says souffle, as this one couldn't get any easier. Add cheese, stiring until melted. Stir in mustard and bacon. Stir in egg yolks, 1 at a time. Beat egg whites with electric mixer on medium heat until stiff but not dry, about 5 minutes. Pour into 12 lightly greased nonstick muffin cups. Bake 25 minutes or until puffed and set.